Shamoon's explosion: Jami Responds, more people open up against "Gumm"
While 2019’s first local release may not be scoring well on the theatrical front, the film, right now, has set the stage for gossips and controversies that Lollywood has rarely seen in recent years. It all started when one of Gumm’s leading actors, Shamoon Abbasi, vented his emotions out first in a Facebook status, and then in a more detailed, exclusive talk with Galaxy Lollywood. 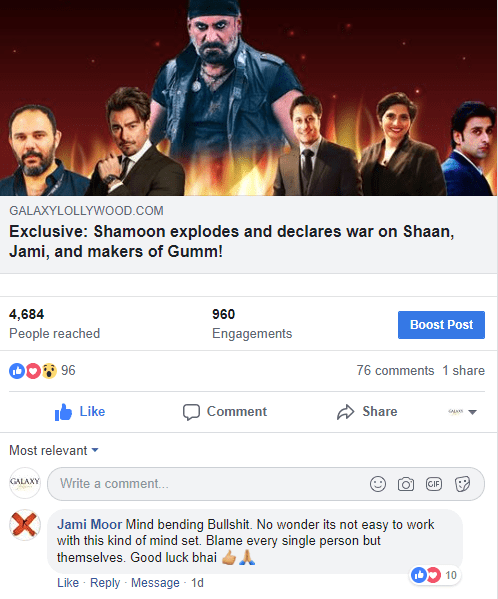 Shamoon not only blasted the minds behind Gumm for being unethical, unprofessional, and any other adjectives in the same lines, he also narrated how the bigwigs in the industry like Shaan and Jami have wronged him over past five years. He later went on in a live Facebook session extended over an hour and basically furthered his accusations against countless A-Listers. More on that later. Looking at Shamoon’s serious allegations, we deemed it necessary to get the point of view(s) of the other side(s) and seek the versions of the people Shamoon had mentioned in his interview. In this pursuit, Galaxy Lollywood first contacted superstar Shaan Shahid, but the actor who shared screen space with Shamoon in Waar and O21, outrightly denied to comment on the matter. Then, we contacted the critically acclaimed director, Jami, who had directed Shamoon in O21, and although he didn’t say much on the issue either, he proved to be a bit more vocal about it than Shaan. To start with, Jami commented on Galaxy Lollywood’s Facebook post on the article where Shamoon had explained his entire ordeal in detail. In a day or so after Shamoon’s revelations, Gumm’s singers, Jia Nauman and Nauman Khan Lashari, also went to Facebook and recorded their allegations against the director duo, Ammar Lasani and Kinza Malik. Where Shamoon’s concerns were multiple and extensive, the Islamabad based singers had a completely different complaint. The singers, who according to their story, studiously worked on two tracks for the film, meeting all requirements of the makers before the deadline, had to face troubles when it was time for payments. They had to face a complete shutdown from Kinza and Ammar and were blocked everywhere. But this doesn’t end here, Gumm‘s project head, Intizar Hussain, who also acted in the film, claimed in a Facebook post that the makers of Gumm hadn’t credited him and his team including the DOP. He asked for a boycott of the makers by the industry and a notice by concerned authorities for the injustice done to them. We tried contacting the director of the film, Ammar Lasani via various channels for his version of the story, but our queries remained unanswered. This forum, however, is available for all the artists who have something to say regarding the controversies surrounding Gumm. Keep reading this space for further developments.